Yesterday, we looked at five stocks which could soar to new heights in 2019, with a focus on companies with a market capitalisation of less than $100 million that tend to fly under the radar. In today’s article, we run the ruler over a final five. 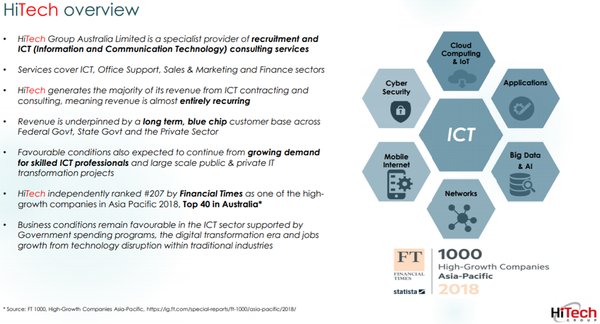 While HiTech tends to fly under the radar due to its size by market cap ($35 million), the company has over 24 years of experience in recruitment and ICT consulting. It provides a specialist talent acquisition service in the ICT (information and communication technology) sector, as well as being a significant provider of staffing services across the office support, sales and marketing, and finance industries. HiTech has a database of more than 360,000 candidates for contracting and permanent positions, making it a leading player in the areas that it services. The company is a preferred supplier to several public (state and federal) government departments and private sector corporations. The company provides contract and permanent staff to over 23 federal government departments including the Australian Communications and Media Authority, the Australian Bureau of Statistics, the Department of Human Services, the Department of Education and the Department of Social Services. Leading private clients include telecommunications group AT&T, health insurance provider Bupa, as well as Sage MicrOpay, a wholly-owned subsidiary of The Sage Group Plc, an international company specialising in accounting, payroll and CRM software applications. HiTech delivered a record financial result in fiscal 2018 with profit up 16% to $2.7 million on the back of a 13% increase in operating revenue. Of particular note is the company’s strong cash balance as at year-end, up 13% to $5.8 million after paying a fully franked 4 cents per share dividend. Based on these metrics, it could be argued that the group’s market capitalisation of $35 million is conservative. Indeed, the company’s forward PE multiple of 10 implies a significant discount based on fiscal 2019 earnings per share growth forecasts of 34.8%. Importantly, management is more focused on delivering strong shareholder returns rather than growing the business with chief executive, Elias Hazouri, commenting in his fiscal 2019 outlook statement: “We are well positioned to capitalise on the consistent demand for ICT talent and services. There was a six-month period between May and November 2018 when accounting services company, Kelly+Partners Group Holdings, consistently traded in the vicinity of $1.30. 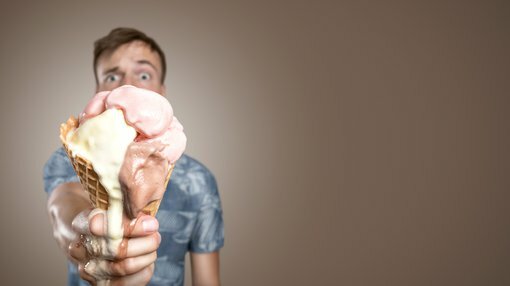 However, weakness across equities markets took its toll late in the year, and in recent months it has traded in the vicinity of $1.10 — arguably a buying opportunity for a stock that looks poised to deliver strong earnings growth in fiscal 2019 on the back of a 30% increase in revenues in fiscal 2018. With consensus forecasts implying compound annual earnings per share growth of 18% between 2018 and 2020, the company certainly looks undervalued, trading on a PE of approximately 10. Since listing on the ASX in June 2017, Kelly+Partners has demonstrated it can generate organic growth from its established businesses, while also successfully integrating new practices in an industry ripe for consolidation. In a model not dissimilar to the medical centre approach — whereby multiple complementary businesses such as general practitioners, chemists, physiotherapists and a range of diagnostic services practices share a common location — Kelly+Partners has taken the opportunity to introduce additional services or expand its existing practices at its established sites. From a broader perspective, the company is a specialist chartered accounting network established in 2006 to provide better services to private clients, private businesses and their owners, effectively providing an option where practice owners aren’t strategically positioned for generational change. The traditional model of handing over long established practices to family and/or attracting a realistic price for the business based on its established reputation has come under threat, as the cottage industry model finds it difficult to compete with large accounting firms. Three acquisitions made since August 2018 are expected to contribute a material amount to net profit in fiscal 2019, and management said in December that it was in discussions with other firms. Management also noted at the time that the existing offices have the capacity to carry up to a further $25 million in billings, and strategies aimed at ‘building out’ these offices are under consideration. Growing from two greenfield offices in North Sydney and the central New South Wales coast, Kelly+Partners now consists of 21 operating businesses across 13 locations in greater Sydney, plus Melbourne, Hong Kong and Auckland. The company has 42 operating partners who service over 5,000 small to medium enterprise clients. The consensus share price target of $1.65 implies upside of nearly 50%, and given that it represents a PE multiple more in line with the group’s growth profile, a return to these levels could be on the cards. Near-term share price catalysts include the delivery of the group’s interim result for fiscal 2019 in February and the strong likelihood of further acquisitions. The 2018 financial year was a transformational year for National Tyre as it undertook a $59 million IPO, listed on the ASX and completed multiple business acquisitions. 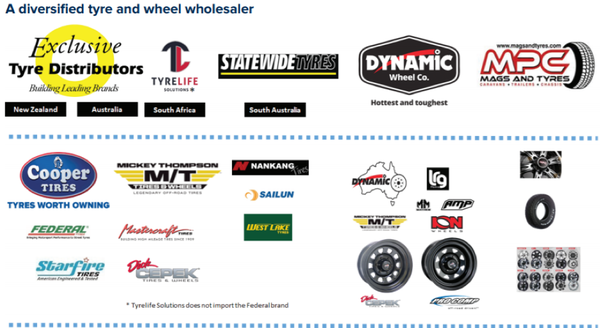 In keeping with the IPO strategy, on listing the company acquired the assets of Cotton Tyre Service, 50% of TyreLife solutions, a South African importer/wholesaler, 45.6% of the Dynamic Wheel Company that the group did not already own and 50% of MPC Mags & Wheels. The company achieved a pro-forma profit result that exceeded prospectus forecasts, and management is expecting EBITDA to be in a range between $16 million and $17 million in fiscal 2019. Earnings are expected to be skewed to the second half of the year, and when management flagged this in November the company’s shares were marked down substantially. However, provided the group delivers on or exceeds its first half guidance of between $6 million and $6.5 million, some respectability could be restored to its share price. Given that first half earnings have been impacted by relatively normal one-offs such as promotional costs and marketing, the company appears to have been harshly treated. It should also be noted that higher than expected inventories in the first half was a function of management taking advantage of cheaper import prices, a strategy that will work in its favour as 2019 plays out. While management did acknowledge some sluggish consumer demand, the fact remains that tyres are a non-discretionary form of expenditure and this should provide reasonable sales stability. In the interim, the company has other irons in the fire, launching a wheels business in South Africa and expanding its wheels customers in New Zealand. The group’s particularly popular Cooper brand is the subject of a customer expansion program. Management expects to pay an interim and a full year dividend with consensus forecasts pointing to an attractive yield based on the company’s current share price. Should this come to fruition, the implied yield may be an incentive in its own right to generate buying activity, regaining some of the share price decline and potentially narrowing the substantial divide between its current levels and the consensus target of 84 cents. RXP is a leading digital services consultancy business with its operations spanning the Asia Pacific region. The company’s consultants provide the insight, expertise and experience required to help businesses in transitioning to a fast-paced digital economy. RXP’s practice model provides businesses with specialist consultants across a wide range of disciplines. The solutions offered are aimed at providing clients with clear business advantages by modernising business processes and optimising IT services to generate greater efficiency. RXP’s fiscal 2018 result was negatively affected by a faster than anticipated decline in traditional consulting work. On a positive note, though, the company completed a number of significant high-profile digital projects in fiscal 2018, and, importantly, this has continued to build the group’s digital delivery reputation. Not only did RXP retain all existing client master services agreements (MSAs), it also expanded the scope of existing MSAs and added several new clients during the year. Management’s investment in digital expansion, including hiring and training of staff to provide excellence in delivery is now resulting in new revenue streams and deeper client relationships. The financial benefits of these initiatives should be evident in fiscal 2019 and beyond, making the upcoming interim result to be released in February a key milestone for the company. Importantly, RXP has the financial capacity to enhance or expand the business. As at June 30, 2018, the company had cash of $14 million, and taking into account debt was in a net cash position of $1 million. This also suggests that consensus forecasts of a 3 cents per share dividend in fiscal 2019 can be realised, continuing the group’s record of consistently paying robust dividends. Based on the company’s recent trading range this represents a yield of approximately 6%. Trading on a forward PE multiple of about 7, RXP’s fundamentals stack up well, suggesting that further confirmation of a turnaround in 2019 could provide significant share price momentum. Perth-based XRF Scientific manufactures equipment and chemicals which are distributed to producing mines, construction material groups, and commercial analytical laboratories in Australia and overseas. These are used in the preparation of samples for analysis, an essential tool for mining companies in particular. 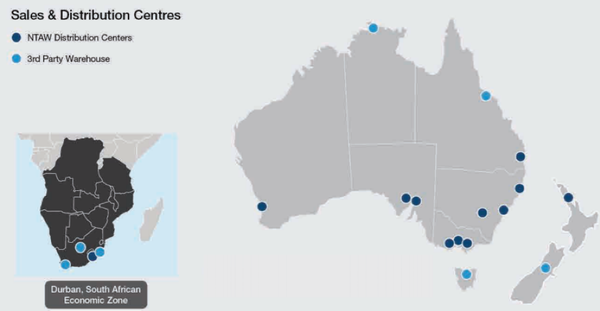 XRF has manufacturing, sales and support facilities in Perth, Melbourne, Europe and Canada, but its market reach extends beyond these areas due to its global network of distributors in areas such as the US, South America, Africa and Asia. The company services most of the large international miners, including BHP, Rio Tinto, Vale and Glencore, as well as working in collaboration with other laboratory groups such as the CSIRO and ALS. XRF delivered underlying revenue and earnings growth of approximately 13% in fiscal 2018, a result that featured strong operating cash flow across the group, as well as positive news on the operational front, with a promising take-up of new products recently launched. Management noted in August that sales activity across the group’s consumable and capital equipment product lines were tracking at record levels following a large inflow of orders in June. There was particularly strong demand for the group’s electric fusion machines, a new generation of sample preparation technology that was first launched four years ago. Management reaffirmed at the October annual general meeting that it was confident of a significant increase in profits in fiscal 2019. The precious metals division made a strong start to the year with revenues increasing by 39% compared with the previous corresponding period. Capital equipment sales growth was also impressive with year-on-year growth for the period to September 30, 2018 up 58%, and with a record order book for electric fusion machines pointing to strong sales for the remainder of the half and into the second half of fiscal 2019, the company’s prospects are looking promising. Earnings per share estimates for fiscal 2019 only imply year-on-year growth of about 8%, suggesting they may be on the conservative side. However, even based on these projections, the company appears relatively cheap, trading on a forward PE multiple of approximately 8.7. XRF has also been a casualty of negative sentiment towards global equities with its shares coming off about 20% since October, and it is another stock that could rally following the release of its interim result in February.